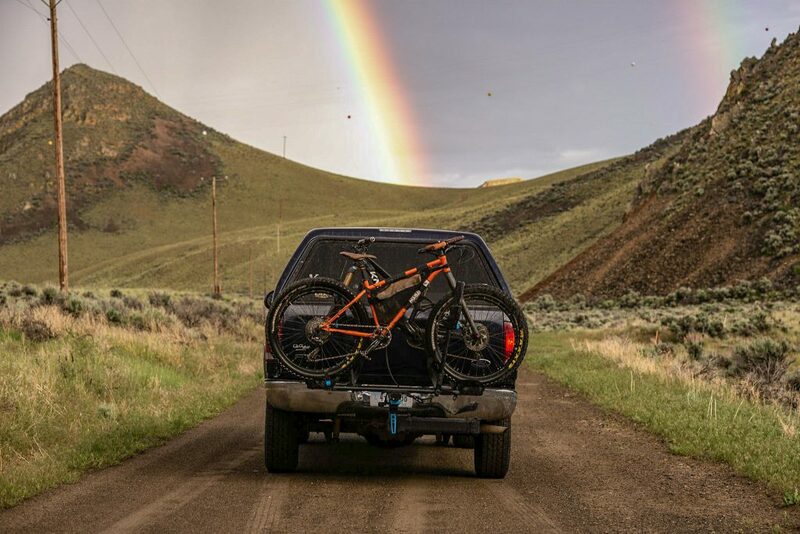 Living in my truck a few months out of the year with 2+ bikes just got a whole lot easier thanks to the BackStage Swing Away rack from Boulder, CO-based RockyMounts. For the past few years, I have been utilizing my truck bed as a mobile studio apartment while driving all over the American West, including my twice a year migration between Montana and Arizona. Usually, I throw an old sleeping pad over my tailgate and pile my bikes into the back with the front wheels hanging out. Sure, this works, but it is cumbersome to transition into kitchen/bed mode and my tailgate and forks don’t love this method either. It was time for a change. Over the last month or so, I’ve been putting this swing away platform rack to the test, driving on everything from shuttle rides in Arizona, southern Utah dirt “roads”, endless stretches of freeway, and backroads in Montana and Idaho. These are my impressions and musings. Sit back and get ready for some nerdery. When I got this rack in the mail, the first thing I noticed was the sheer heft of this piece of equipment. Normally, cycling accessories are meant to be light, but in this case, I was immediately stoked. If I’m going to be strapping my most valuable possessions to something, it better be burly. The assembly was fairly quick and easy, and tools were included. A ratchet with hex key attachments and sockets would have made this job simpler, but that’s not an issue. The lateral adjustability of the wheel platforms is a great touch, as it allows one to stagger the position of the bikes to try and avoid the saddle/handlebar conflict that so often plagues bike racks. My only gripe with the construction of this rack is the use of a plastic insert that guides the swing handle, but I’m sure there is a reason for this. I’m a mountain biker, not an engineer. The use of Nylock nuts and redundant washers is great, even if it makes the assembly a bit more cumbersome. Loading bikes onto this rack is very straightforward, almost too much so. Making sure that the front wheel arm is as close to the fork as possible, and getting those last few index clicks on the slider by compressing my tire a bit is definitely necessary, but when done right has yielded awesome stability. 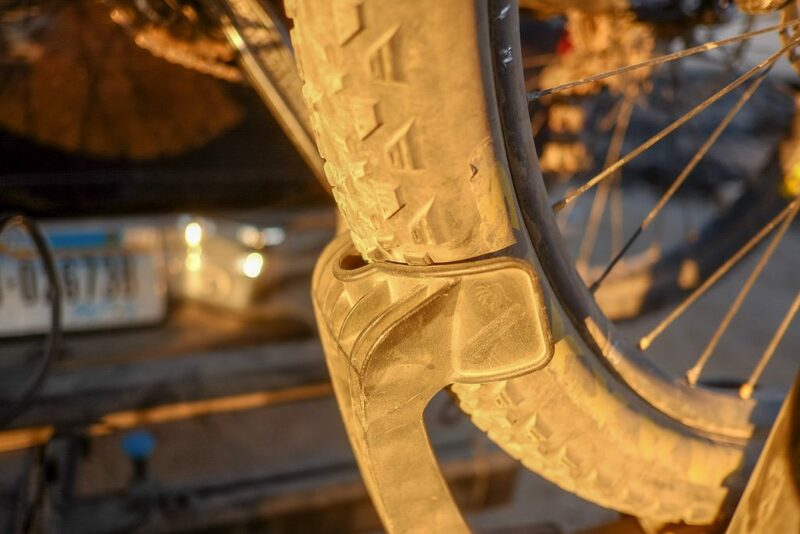 I’ll admit that the first time I used it, my bike became loose because I didn’t clamp the arm down tight enough or close enough to my fork crown, but that was user error. To prevent such user error, It would be nice to see the arm be able to lock into place at the pivot point as well, for added peace of mind. 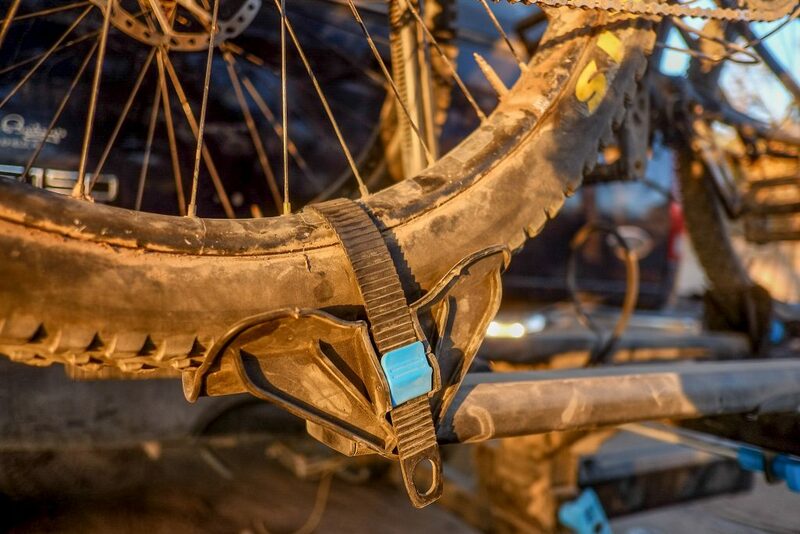 Once bikes are on the rack and the securing strap and arm are locked in as designed, they remain super stable, secure, and safe. 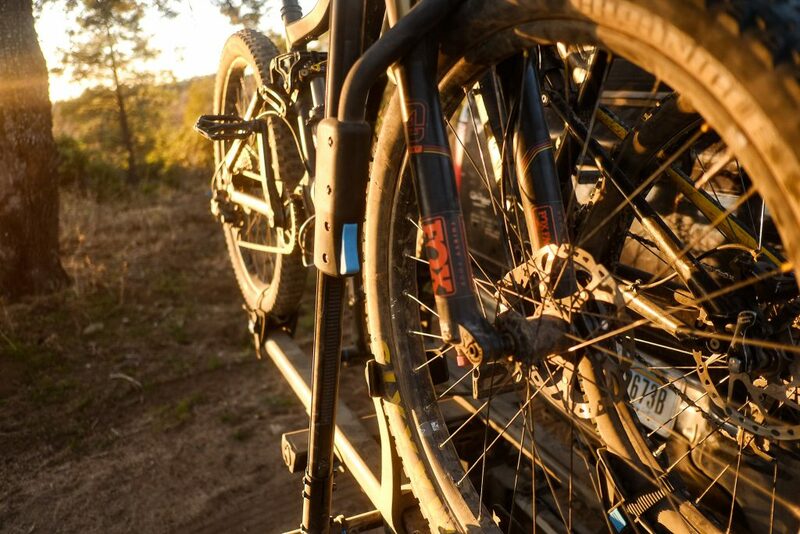 A cable lock is included, as well as a lock for the rack into the hitch which are both welcome additions. Though it seems obvious, the fact that this is a platform style rack as opposed to a “through the frame”/hanging style is a huge benefit. My size small Knolly Endorphin has trouble fitting onto hanging racks, and I love that I can just leave the frame bag on my bikepacking rig. As far as I’ve seen, the BackStage is the only fully swinging platform rack that isn’t custom fabricated or quite pricey. On the road, the rack is pretty stable, with minimal sway. Though the rack does sway a bit, I haven’t found it to be an issue. The hitch bolt threads into the rack itself, and this helps. Some sort of expansion wedge, similar to those used in Park Tool shop stands could reduce the sway even more, but really, it’s not a big deal. I’ve never felt insecure about the rack rocking back and forth too much, even on uneven dirt roads and twisting two-lane highways. Swinging the rack away from the truck is the biggest reason I love this piece of gear. 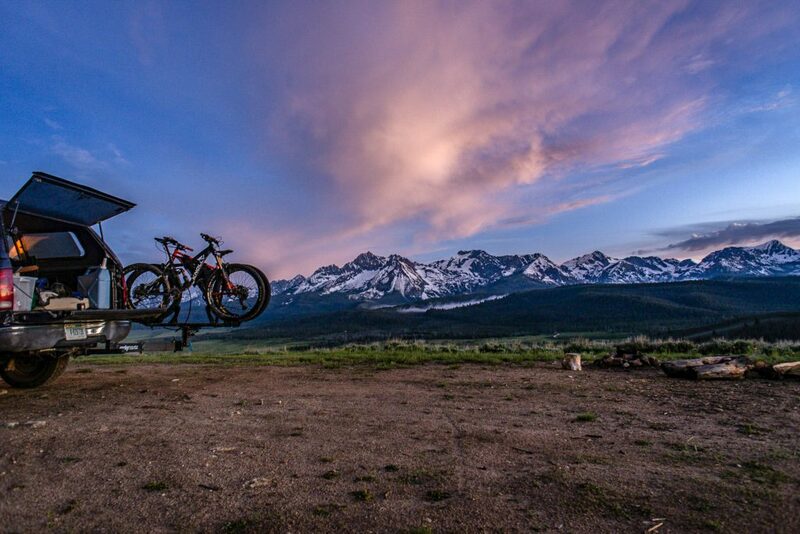 Whether setting up a kitchen, getting ready for a ride, settling down for the night, or making a cocktail, the BackStage follows it’s namesake and takes the backstage to whatever task I have at hand. After sprung lever that threads into the base of the hitch system easily unthreads, and a spring-loaded locking bolt is pulled away, the whole thing folds away, leaving plenty of room to drop the tailgate and do whatever I need to do. The fact that the rack swings away laterally as opposed to vertically towards the ground is another welcome feature that makes those 2 am cat hole runs a bit less awkward. I’ve received plenty of comments from friends about how nifty this feature is. I even caught one friend who was on crutches at the time sitting on the rack as it was extended away. Though I can’t recommend this, it is a testament to just how much this rack ends up blending into the tailgate-camp environment. No bikes dangling out of the truck or awkwardly piled only to be put back into the bed; just a few motions and the tailgate is all yours. The rack also folds up when not in use to make parallel parking simpler, which is welcome, especially for me. 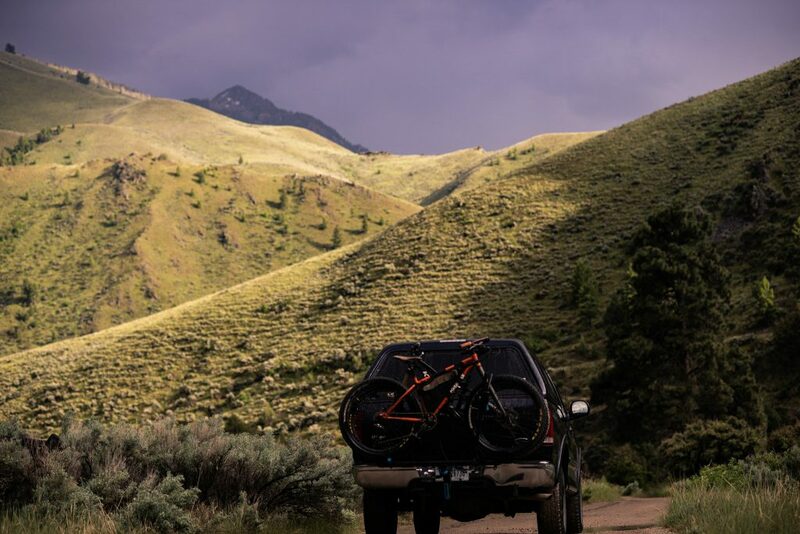 Overall, I would highly recommend this rack to anyone who spends time road tripping and mountain biking while using their vehicle as a base camp. 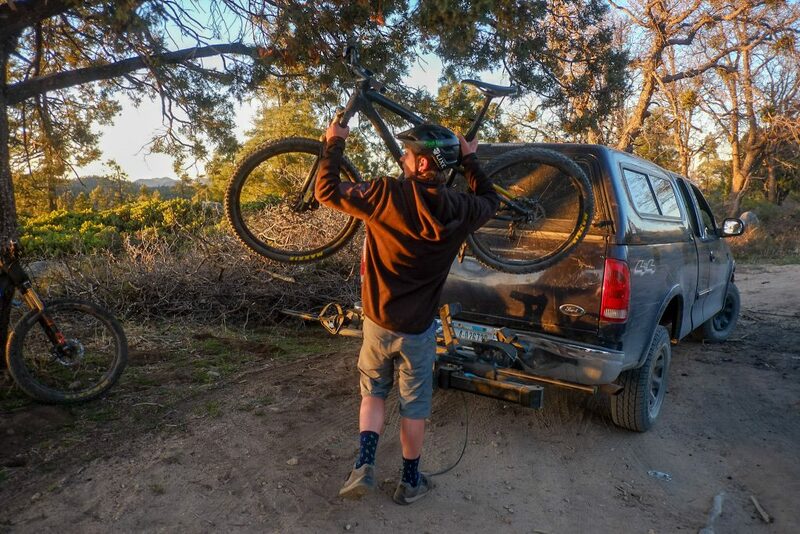 Even without the swing away option, it’s a super sturdy piece of gear that makes loading and unloading bikes of any shape and size a breeze. Its solid construction might take a few mpg off, but the peace of mind is well worth it. Though the design could be tweaked a bit (less plastic, redundant arm locks, added sway prevention) those changes would only improve on a fantastic system. The BackStage takes 95% of features I would look for in a rack and bundles them all into a sturdy, attractive, and reasonably priced package without adding any frills. It just works, and then gets out of the way when you want it to. What more can you ask for? Shop the RockyMounts BackStage Swing Away Platform Hitch Rack on Outdoor Prolink. Not a member? Apply today! 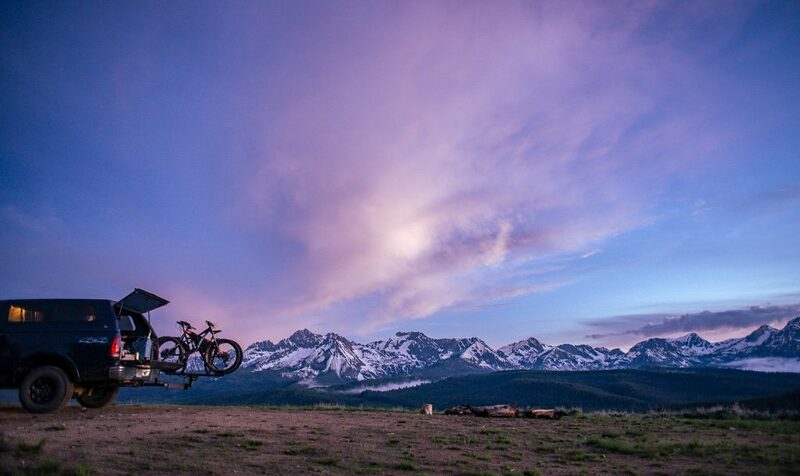 Locke Hasset is an avid mountain biker, bikepacker, and photographer. 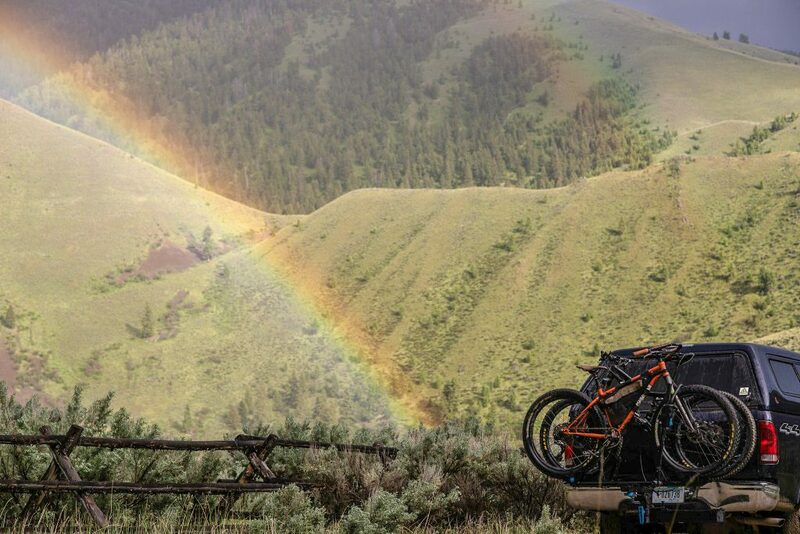 He has worked as a raft guide, backpacking guide, road and mountain bike guide, and mountain bike coach. Currently, he spends his summers facilitating outdoor education through youth cycling programs in Montana and California, and his winters studying environmental education and working at the community bike shop at Prescott College in Arizona. 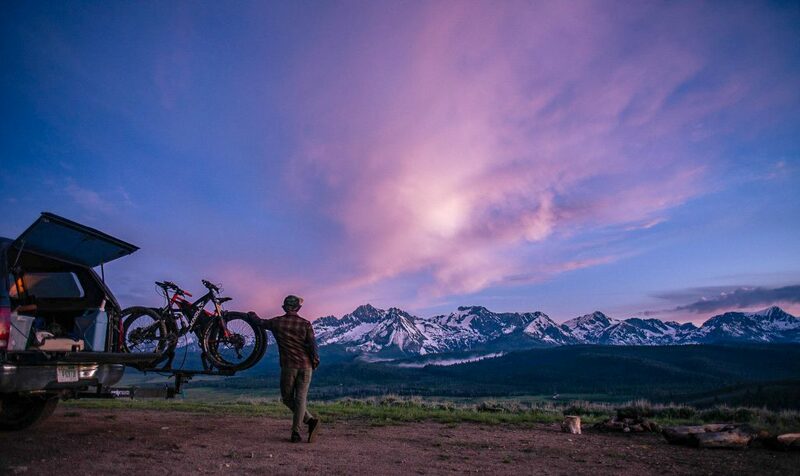 When not riding backcountry singletrack or teaching kids about natural history or body positioning on the bike, he is driving around the American West in search of rugged trails, wild rivers, good light, and great coffee.